In true Moser tradition, every detail of the Edo Open Sideboard exists to serve a function and will bear years of daily use. Its open design features three dovetailed drawers. From the font, the profile could not be more basic, yet closer inspection reveals remarkable attention to detail. Four legs, attached at a compound angle, are connected to a grain matched cherry or walnut top. In addition to adding storage space, this piece offers strength and anchors the eye. The Edo Open Sideboard, part of our Edo Collection, is inspired by the concept of wabi-sabi – originating during Japan’s Edo period. 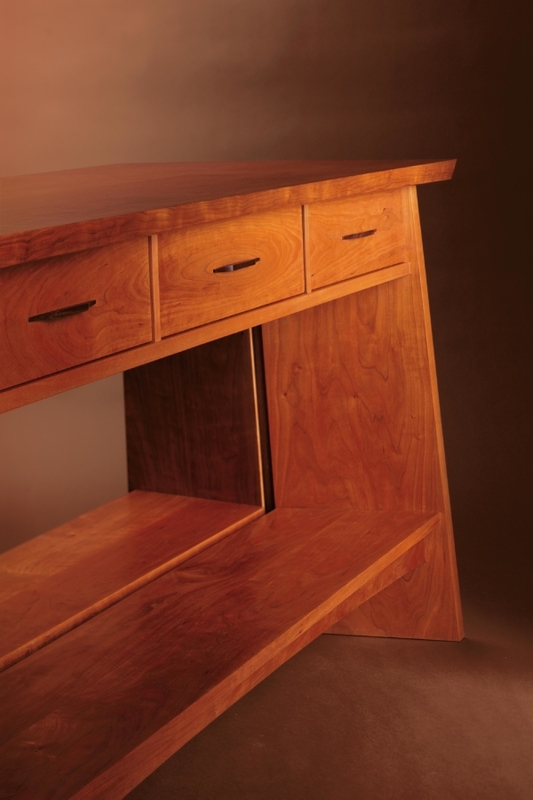 The case offers both modern and ageless appeal with dovetail drawer construction and clean, simple lines. The richness of discreet end grain inlays and contrasting drawer pulls add a subtle demarcation and fuse the top, sides, and front visually. The Edo Open Sideboard works seamlessly with the other pieces in our Edo Collection, but its clean profile allows it to function well with any style of dining decor.